My name is Andrea Duhe’, and I am a variety entertainer and artist. 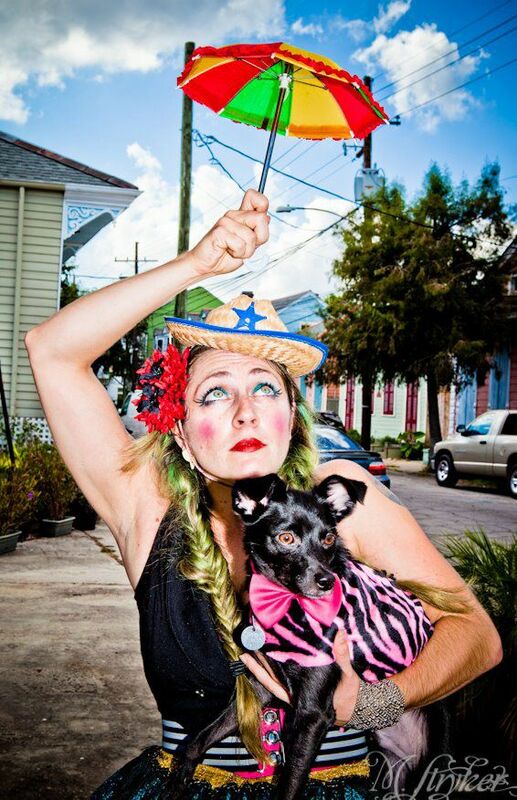 My stage name (and all around nickname) is Ooops the Clown, I also go by the name Ooops C. I perform comedy skits, burlesque, acting, dance, aerial, hula hooping and have a dog act with my little talented pup, The Famous Mr. Cheeze. I am have been a variety entertainer and burlesque dancer for over 10 years. I am currently involved in several different projects and productions. I am a Louisiana Native and live in New Orleans. I produce and perform in a weekly shows. I do travel for special events and shows. I have toured nationally and internationally. Aside from a full time performer, I have an array of expertise that keep me busy. I teach burlesque and pole classes for bachelorette and birthday parties. I am a fortune teller that reads Tarot Cards for events. I make head dresses, mostly for showgirl related work. I am a freelance model for all kinds of photography. I also work as a seasonal make up artist for Mardi Gras parades and parties, Halloween costumed events. I am an experienced facepainter for over 20 years. I am often hired as reveler and costumed character work. I model for fine art photography and artist in general. Before my career path as a performer I was a painter so I appreciate visual art endeavors. I am currently expanding my dance education by taking Belly Dance Classes. I upkeep my ability as an aerialist by training and working out regularly. I am an open book and happy to answer questions about my skill set, acts, or shows. If you are interested in booking me or any of my current projects please contact me.